RE: Robert Young fakes run across America 6/16/2016 8:18AM - in reply to not the full shiling? However, this is a guy with a wife and two children and I hope that he can move on from this whole chapter afterwards. Maybe Rob will move out of running after the dust settles. Did we ever learn what cycling team Rob rode for? They keep refusing to answer this simple question. If Rob was ever any type of pro cyclist, he wouldn't have horrendous pacing. 0/10??? He trolled a handful of people, including you, with a few incoherent lines. And that in a 200 pages long thread. This could be the basis of a (collaborative?) LetsRun article. it can indeed, and it can also be examined and found to be doctored. I'm sure there's lots of people on here that will be able to find out if he meddled with GPS data. But we all know it will never be made public. â€œWell the pain of running beats getting a nail hammered through my foot. Not really anything is as painful as that.â€ He remembers being zipped in a suitcase and pushed down the stairs, and being hanged with a cord attached to a coat hanger. Brion O'Connor, who wrote the original article for Sports Illustrated regarding RY's attempt to break the transcon record, has written a follow-up article (dated Wed, June 15) exposing many of the questions that have arisen about this. This needs to be added to the google docs summary and RY's wikipedia page. Early in this thread, at least 3 posters on here contacted Brion and it's nice to see him follow up on this story. If someone asks me for a summary of what has transpired, I will link them to RacerGirl's summary. Here's the link if you don't already have it. 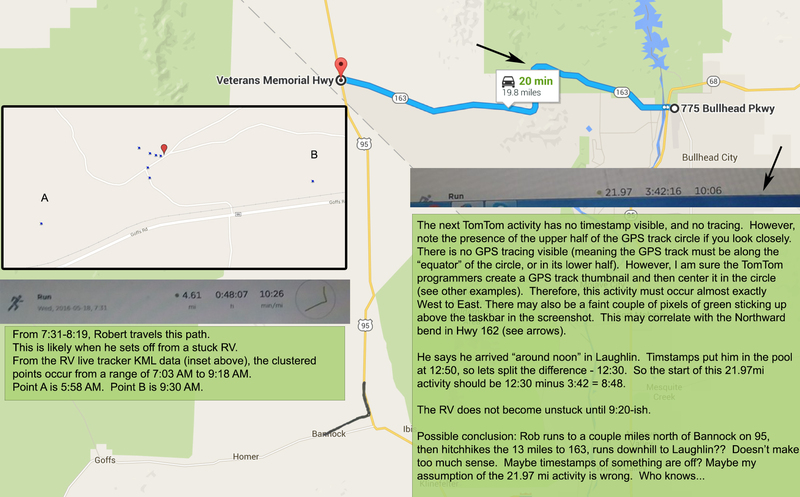 And here is the graphic illustrating the impossible day in the desert from the RV breakdown to Laughlin. I'm surprised he thinks it's a laugh getting inside a suitcase. Kind of undermines the seriousness of the allegations he makes, and child abuse in general? This is all so weird. Not sure where to start really. He fought hard against "Worldrunner" Robert Garside on his outragious claims of running solo with a backpack around the world. David Blaikie "Declarations by friends and crew are not worth much unless supported by a strong cache of daily data collected along the way - as mentioned in an earlier post. GPS data may prove where a support vehicle was at any given time, and it is useful when coupled with persuasive supportive data, including signatures (with contact information) collected daily from independent witnesses along the way, but it will not prove a runner covered the whole distance on foot, or any of the distance for that matter. The accumulated evidence at the end of the run has to be compelling and believable to knowledgable and experienced ultrarunners who know the extreme challenges posed by covering such long and arduous distances day after day in the hostile environment of open highways. This also includes detailed daily logs of starting and stopping points, (recorded exactly, within 1/10th of a mile or kilometre, on a verified vehicle odometer), weather records, precise road and highway routes taken by the runner, (data which can be checked against local highway construction records, if necessary), plus detailed receipts with time stamps for purchases made along the way of food, beverages, gasoline and other items. Media coverage is also useful, but entirely inadequate on its own. It proves little. Al Howie kept meticulous records when he averaged 101km a day in his epic run across Canada in 1991. (See Wikipedia link below). Unfortunately, the history of journey running is fraught with frauds who dupe a few reporters and sponsors with their claims but cannot prove the actually ran the distances claimed. Their runs are at best undocumented and at worst exaggerated claims or simply fraudulent. The onus is 100% on journey runners to back up their claims. There is not and should not be any benefit of the doubt given. The testimony of friends, family and crew is helpful when combined with all of the above but of little value on its own because they are interested parties. The fact that the Guinness Book of Records accepts a claim is meaningless. Guinness is in the entertainment business and many of the 'records' it has accepted over the years are bogus." Bro, didn't you read his early history? His dad put a rope around neck and hung him in the air. What kind of mental state do you think he would have? And do we know this too be true? Or if mentally ill something else? please don't post anymore coachkev videos. i am picturing him as simon pegg and don't want to destroy the mental image. Attention all INDY runners. Give us some eyewitness reports, pics and videos. Need to put some sights and sounds to this historic thread. (Feel free to take pics of Laz and any other of the cast of characters).